Regimental Kukri Fixed Blade Knife | BUDK.com - Knives & Swords At The Lowest Prices! 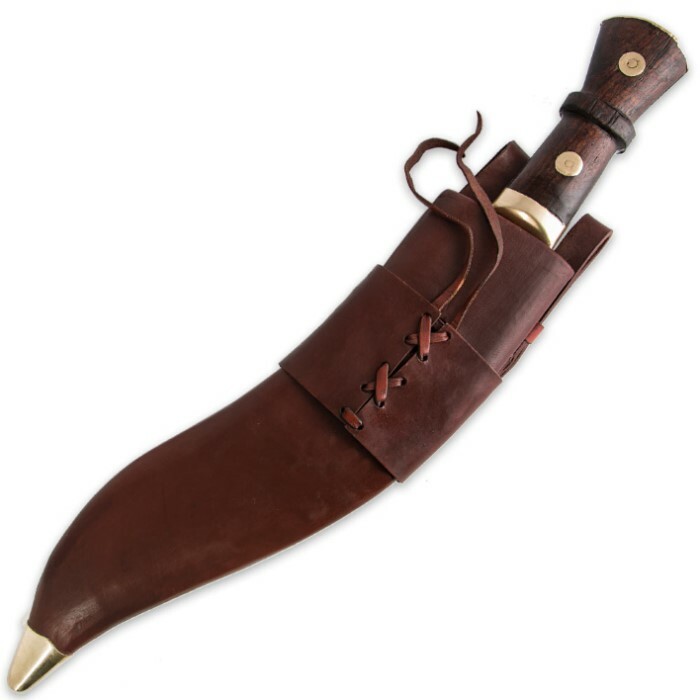 Perfect for collectors and historical enthusiasts, our Regimental Kukri abounds with old-world style and authenticity. 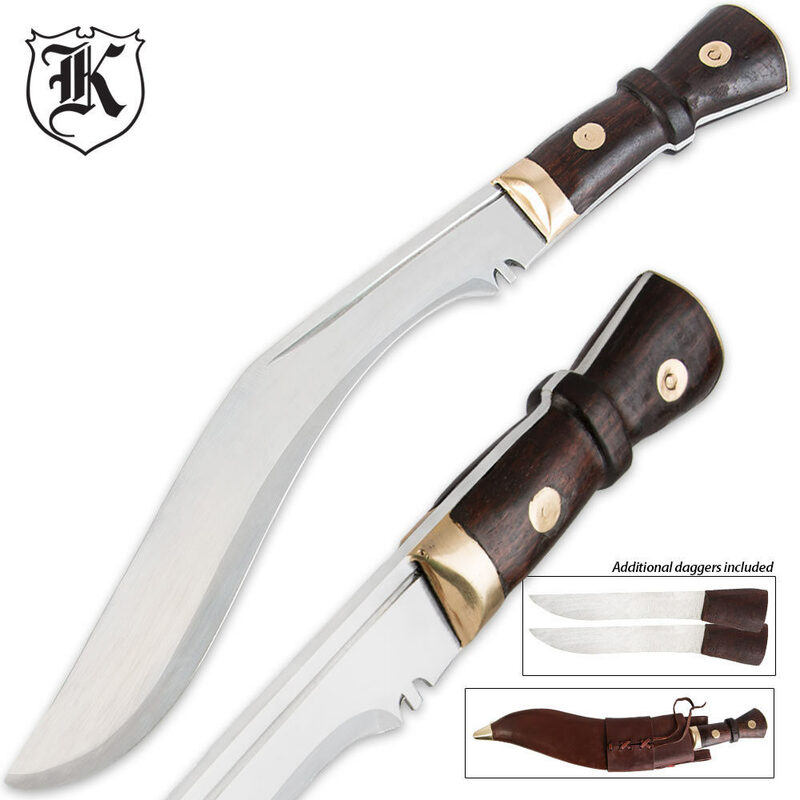 It utilizes full-tang steel construction with a high-polished 12-3/4" kukri blade. The hardwood handle is accented with brass fittings for an aged, antiquated look and feel. The embellished leather scabbard houses the blade and two matching 4" tools—a small cutting knife and a miniature sharpening steel/fire starter. It's a capable size at 18" overall. Sheathe is a painted brown. The hangers are a nice design with the adjustable pins for length. The blade is undeveloped which is traditional for this fighting knife. The grip is hit or miss horrible in execution. Voids in the wood and metal. The price reflects the quality. Good for the price. Serious fighting knives of this design are way more expensive. This is a good and almost great price for this item. I have a shop so I developed and sharpened the edge and reworked the grip. If this is a project you want to take on...get it. Just to clear it up for those who don't know, these types of weapons were issued to India regimental troops in the era in which their firearms were mostly muskets and other black powder weapons. The two tiny knives that come with these are called patch knives, and altho you could still find plenty of random uses for them, they were primarily used to trim the patches when loading their muskets. So there's some history for ya. Just got tired of hearing that they were skinning knives or throwing daggers, or any of the other myths ya hear. With that said, I have a couple of knives similar to this, both traditional and tactical, and the blade design is meant for chopping or slashing, so as a camp knife, very handy and as you can expect , the smaller ones for cutting cord, or using as a eating utensil, come in real handy. Just got mine. The blade needs an edge put on it but the sheath won't slide up on the blade and there are no holes for the little blades. Disappointed and paid too much for what I got. I can make a new and better sheath and put a descent edge on it. Just got the Item in expected a really nice product. It was but the blade is not sharpened . The Regimental Kukri is what I have been looking for for some time and I am very pleased at what I received, but the only thing that I am disappointed in is the sheath, it seems that the sheathes were made before the Kukri blade was ever made and the blade is smaller then the inside of the sheath, bad match up. Also, the two smaller blades don't even have a place to be mounted, poor decision on the makers part. Don't get me wrong I love the Regimental Kukri and will get my third one as soon as I build new sheaths for the two I have now, I just can't use the ones that came with the blades, sorry I just need stronger sheaths then what came with the Kukri blades. Strong, full tang, hefty. A well constructed weapon. However, the finish was tarnished and there was literally no blade on it. If you look at the tip from the spine side, it's perfectly square. It would take hours to put an edge on, and I'm just too lazy for that. I can't use this for anything practical, so it looks like I'll keep it in its sheath (which is pretty nice) and hope something needs a thin bludgeoning tool. I have purchased several and I will continue to buy more. It is the luck of the draw of what and where you get yours from, Most recently they've been coming from India but that is okay. They are cut from 1/4 inch leaf springs and each one is hand made. I appreciate that they are each distinct and that some old man or maybe some youngster taught by his dad sat in the dirt in a grass hut and pounded this thing out. The real test is when you take it out in the wild and hack through anything standing in your way. Mine have come from Nepal, Bhutan, India, China, Bangladesh, and Burma (Myanmar) and one other place (begins with M) I couldn't really make out. One of my favorites has China inscribed but it has a name written in Nepalese with it. I've been buying them for years. If they are so strong, reliable and sturdy why do I need so many... because.